Even during the life time of its founder, Buddhism was accepted by a large section of people. The People of Magadha, Kosala, Kausambi, the Republics of Shakya, Vajjis and Mallas had embraced Buddhism. Ashoka and Kanishka made Buddism a state religion and spread it to Central Asia, West Asia and Shri Lanka. The appeal of Buddhism to a large section of population was because of the following factors. • Emphasis on practical morality, a simple philosophy and easily acceptable solutions to the problems of mankind. • The idea of social equality laid down in the codes of Buddhism. • The use of Pali language to explain the doctrines. Sanghathera: Also known as Samgha Parinayaka, sanghathera was the elected President of the fortnightly assembly of Buddhist monks. Tathagata: One who has attained the truth. Visuddhimgga: The first systematic and philosophical treatise on Buddhist doctrine. Om Mani Padme Hum: The most important mantra of the Vajrayana. Dohakosa: The last Buddhist text produced in India. Prajnaramita: Collection of sutras, which deal with the doctrine of Sunya or Nothingness. Like Jainism, Buddhism also faced dissensions. Buddhism was divided into three main sets. 1. 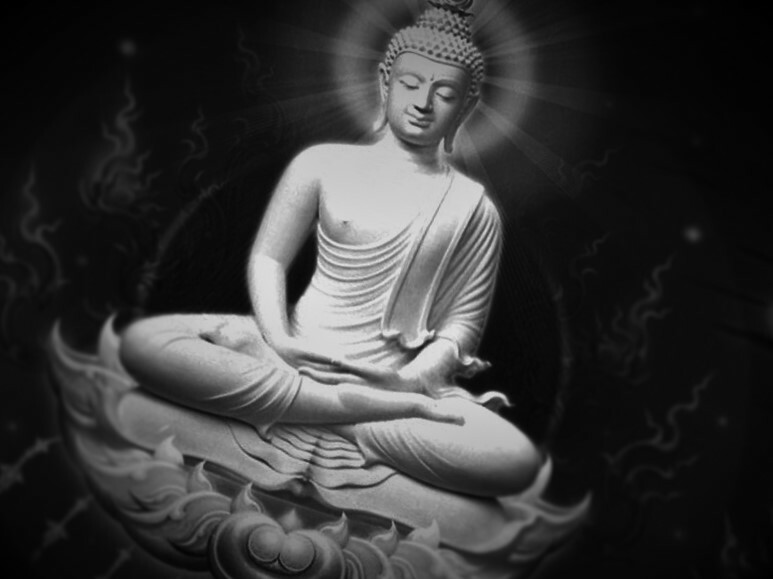 Hinayana or the Lesser Wheel: Its followers believed in the original teachings of the Buddha. They sought individual salvation through self-discipline and meditation. They did not believe in idol worship. Hinayana is a religion without God with Karma taking the palace of God. The oldest school of Hinayana is the Sthviravada or the Doctrine of Elders. Hinayana Buddhists used Pali language, since it was the language of the masses. Asoka patronized Hinayanism. 2. Mahayana or the Greater wheel: Its followers believed in the heavenliness of the Buddha and sought the salvation of all, through the grace and help of Buddha and Bodhisattvas. It believed in idol worship. Mahayana had two chief philosophical schools namely the Madhyamika and Yogachara. Sanskrit, the language of scholars was used by the Mahayana Buddhists. Kanishka patronized Mahayanism. Later, Harsha supported it. 3. Vajrayana or the ‘Vehicle of Thunderbolt’: Its followers believed that salvation could be best attained by acquiring the magical power, which they called Vajra. The chief divinity of this new sect was Tara. It became popular in Eastern India, Particularly in Bengal and Bihar. The Buddha had two kinds of disciples the monks and the lay worshipers. The former were organized into the sangha or the congregation. The membership of the sangha was open to all persons, male and female, above 15 years of age and who were free from leprosy and other infectious diseases. There were no caste restrictions. The Sangha was governed on absolutely democratic lines and was empowered to enforce discipline amongst its members. This life of monks and nuns was strictly governed by laws and Ten Commandments and there was no room for personal likes or dislikes. On admission, the monks had to ceremonially shave their head and wear yellow or saffron robes. The greatest defect of the Snagha systems was the absence of a central coordinating authority. Buddha admitted females to the Sangha, only on the repeated requests of his chief disciple Ananda and his foster mother Mahaprajapati Gautami. Sanghas also promoted education among the people. A Bhikkhu was not a priest in the sense of the theistic religion and was rather the torch bearer of the dhamma and acted as friend, Philosopher and guide of the laity in all the religious and social matters. The higher ordination of Bhikkhu was called the upasampada. Every Buddhist monk has to be samanera, before being ordained as a fully fledged member of the Sangha.